Many Salix species make their home in all parts of Canada – a very useful and highly adaptable shrub or small tree. Many native species are seen in wild areas along creeks, in the mountains or wherever there are open areas to pioneer. 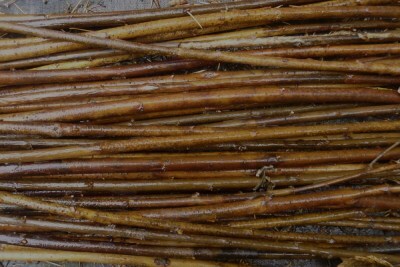 The cambium layer of Salix twigs is the source of salicylic acid, the basis for our common or garden variety of fever reducing and pain killing Aspirin. The native willows – Salix bebbiana, Salix exigua and Salix interior are common in all provinces along streams and creeks, relishing the moisture, not even minding seasonal inundation. In some cases they are deliberately planted by inserting big cuttings into the banks of streams and rivers to prevent erosion, as shelterbelts and windbreaks in windy areas on the edge of fields. It helps to have a flat area for you to work among them, to prune and collect the canes; nothing is more guaranteed to dampen your enthusiasm for rustic crafts more than struggling through mud, rough ground and undergrowth while collecting your supplies. Rooting easily in any moist soil, these are valuable for insects and wildlife – the pollen is an important early food source prized by bees just coming out of hibernation, the twigs are browsed by moose and deer, and birds scrounge for insects in the long flexible branches. They are also utilized by rabbits and voles during the winter under the snow – they can do a lot of damage to the stems, but don’t worry, they will grow back even better than before. Many hybridized Salix varieties are used in ornamental settings. All willows are beautiful in summer with a breeze blowing their leaves over to expose the silvery undersides of the leaves, and lovely in a snowy field in winter with the bright colours of the bark dramatically outlined against the white background. One of my favorites is Salix koryinagi 'Rubykins', a Japanese cultivar prized for the long whippy stems and developed for making willow baskets, . Care should be taken in deciding the location of willows, as their reputation as a septic system destroyer is come by honestly – never plant willows near sewer lines or water lines as they are moisture hogs and love the nutrient rich soil and water near these necessary and delicate systems. One interesting thing about working with Salix twigs is the smell – both in the newly harvested form and dried. The scent is sweet, and when burned (as you will have scraps) it’s even more intense. The uses of Salix for crafts is almost endless – they have been used for centuries as twig basket making material supreme, for fish catching implements, creels, cradles, laundry baskets, and the larger twigs are prized for making into twig lattice, hurdles, gates and fences. Larger yet the main trunks of willows are used for twig furniture. Also look for diamond willow for an even more elaborate design for special applications. Salix benefit from coppicing or a hard pruning right back to the stool which will produce many long straight twigs and canes during the following summer. This should be done in early spring before the new growth emerges. Pollarding is a similar system but allowing a tall stem or trunk to develop, then cutting back the new branches annually to the top of the stem, forming a pom pom effect. Managed properly, your Salix can be utilized in all stages – allowed to grow for two and three years the bigger willow twigs will be used for larger items, while the one year twigs can be made into baskets and smaller craft projects. The canes can be stored in cold basement or root cellar or used immediately for twig balls, obelisks, twig trellis making and other crafts. If they are dried out for later use, they must be soaked at least overnight before use in willow baskets, wreaths and other crafts. 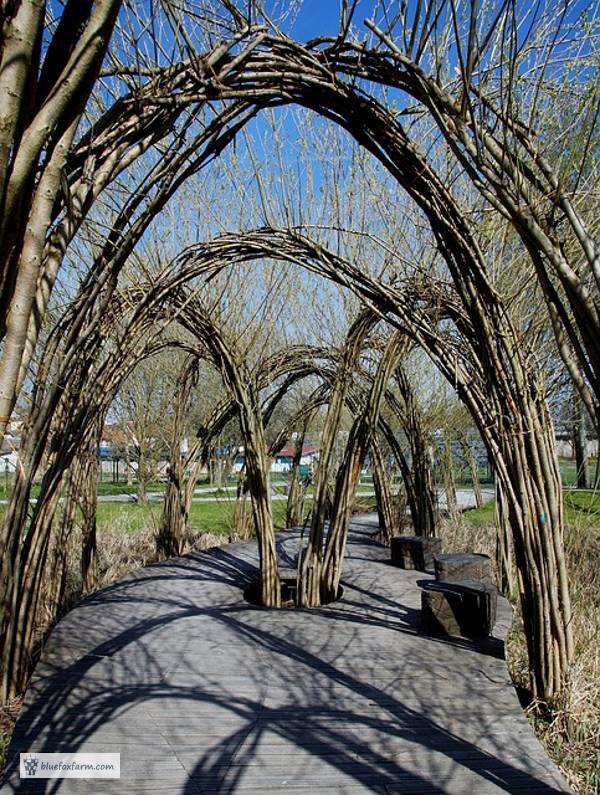 Willows, being so flexible, can be twined together without nails, string or wire to make tunnels and other living sculptures. Fedges are fences or hedges where the willows are cut down every year or two, allowed to grow back, then woven together, making an almost impenetrable barrier for animals. Even if a large cow breaks through, it's easy to mend the gap with more poles, and the willows will grow back to fill it with more live plants. 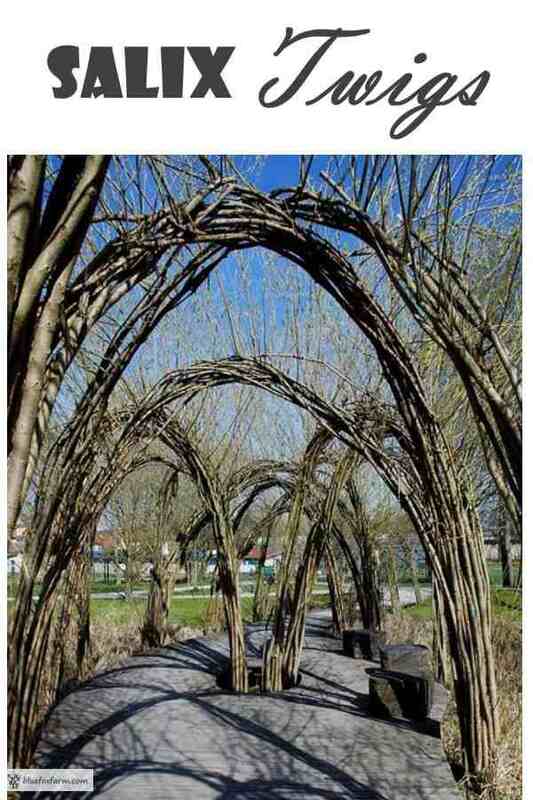 With living art such as the archways above, the new growth is woven and twined back around until a surprisingly sturdy structure is produced. In the spring and summer it's like being under the ocean, surrounded by green.